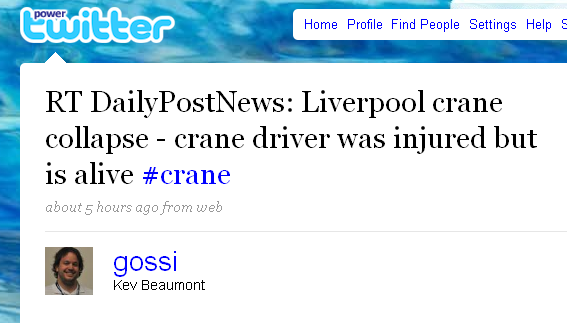 A crane fell down in Liverpool today, crashing onto an apartment block, and I knew about it within seconds, from two sources. Within seconds Thom and Stuart Robarts at FACT had photos online via Twitpic and Flickr (Thom used a rather ingenious method of combining iPhone and binoculars to get a shot) before photographer extraordinaire, Pete Carr, heard about the news and headed off with his kit. 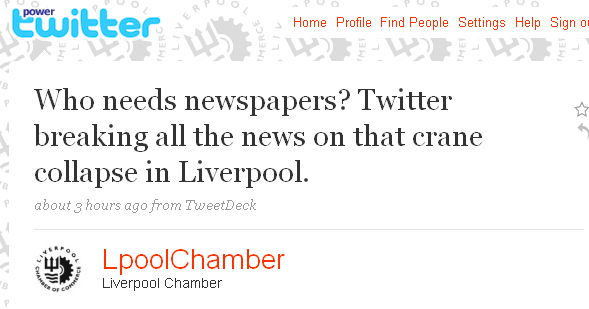 The Echo and Post had great copy, a map, images and video on the websites but it was taking too long to cache, so we made sure the papers Twitter streams kept up constant breaking news with links back to our copy, while retweeting locals who had images on Flickr and other sites. Need newspapers? maybe not, but a lot of those on my networks wanted journalists to ask the questions they wanted answers to. After all, everyone knew one fact – a crane had fallen onto flats – but it was journalists from the Post&Echo who were trying to fill in the details. Scores of people were asking if anyone was hurt, were people trapped, just what had happened – and we were able to answer those queries only because we had reporters on the ground, in the office making phone calls to the emergency services, and talking to the HSE, among other. We managed to wrongly credit @FACT_Liverpool on the Echo’s changed front page but since the story broke as the print run was in progress, it was inevitable a mistake would creep through. Anyway, it was a good way to combine as many different strands of storytelling as possible. Traditional print, mixed with online social media, staff video and photos, and broke the news, then kept updating the story, very effectively. I also put together a quick Dipity Flipbook of a feed grabbed from Twitter Search, which should update itself in the future. 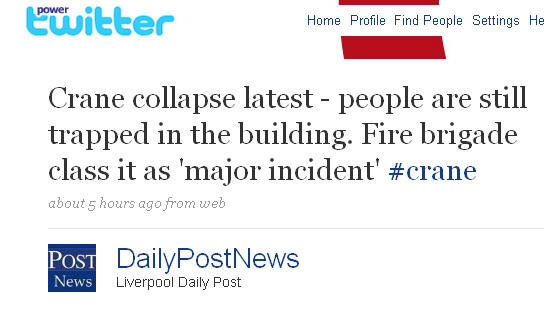 crane collapse – Twitter Search on Dipity. I could have made the search term wider but you’d be amazed how many tweets contain the word ‘crane’ without it ever being in reference to “Any arm which swings about a vertical axis at one end, used for supporting a suspended weight“, let alone collapsing ones. Who’ll teach the new tricks now the old dogs have left? Congratulations for your Blog, and for your very interesting article. FROM THEN ON supports Zelaya inconstitutional and ilegal presidency. Phil was quite impressed that within about 20 seconds of my tweet the phone rang and it was you guys! Pretty surreal to be in the middle of something like that. Glad that the driver seems to be ok, I can't help thinking what would have happened if it wasn't a weekday and more people were at home! I followed a few more of your Twitter feeds yesterday in order to keep up with what was happening. Newspapers may be a dying medium but professional journalism is as important as ever and still worth paying for.